How is it determined which / how many at large delegates there are vs. how many congressional district delegates there are? Alabama for example, gets 10 at large delegates (delegates just for being a state), 21 district delegates (3 per CD), and 16 bonus delegates for party strength. So are the 21 district delegates the only ones that can be allocated by CD, while the 10 at large delegates plus 16 bonus delegates would have to be allocated proportionally based on the statewide result (assuming Alabama keeps its early primary)? There are five delegates for each US Senate seat (5x100) and three delegates for each congressional district (3x435) plus delegates for the territories and the bonus delegates. Each state before April 1 has to allocate its 10 "at-large" delegates proportionally. However, those states can also choose to allocate their remaining 3xN congressional district delegates using the winner-take-all (based on the vote within the district) method. It does not say so in that memo, but looking back at the 2008 GOP allocation, those bonus delegates are lumped in with the at-large delegates and are allocated based on the statewide vote. Those would seemingly have to be allocated proportionally given these rules. There are also three party delegates from each state and territory that are akin to superdelegates on the Democratic side. Those delegates are free to line up behind whichever candidate they choose. So, taking Alabama as an example, each CD in the state would get 3 delegates, regardless of how heavily Democratic or Republican the CD is? The states aren't free to do what the Democrats do, and give different districts different numbers of delegates based on party strength? If so, then at least in pre-April 1 primaries, there's definitely a built in advantage for GOP candidates who do well in more Democratic areas. I mean, if you have a primary in New York, and every congressional district gets the same number of delegates, then the few Republican voters in Dem-heavy districts are going to have outsized voting power relative to those in districts with many more Republican voters. Plus, New York has almost no bonus delegates, so the bulk of the state's delegation would be decided by CD. Similar thing happened with California in 2008. Each district got the same number of delegates, but of course there are huge differences between different districts in terms of how many Republicans there are who would be voting. Also, how is the allocation by CD going to work if the state "breaks the rules" and votes in February? They lose half their delegates, right? But if we have 3 delegates per CD, then half of 3 is 1.5. Are there going to be half delegates, or will the allocation by CD change? All districts get a fixed number of delegates, so yes, Democratic-heavy districts would have fewer Republicans and thus more weight placed on their unevenly distributed votes (relative to more heavily Republican districts). As far as the penalties are concerned, let's be clear to point out that while the allocation is based on congressional districts in some states, that doesn't mean that each congressional district sends three of its Republicans to the convention. Everything is applied statewide. In other words, the party just halves the total. In cases where there is a half delegate left over, they round up. South Carolina in 2008, for instance, had 47 delegates, but lost half for going in January. The Palmetto state Republicans ended up with 24 delegates in St. Paul. Right, but how does that then work for states that vote in February and take the 50% penalty, but also allocate some of their delegates by CD? 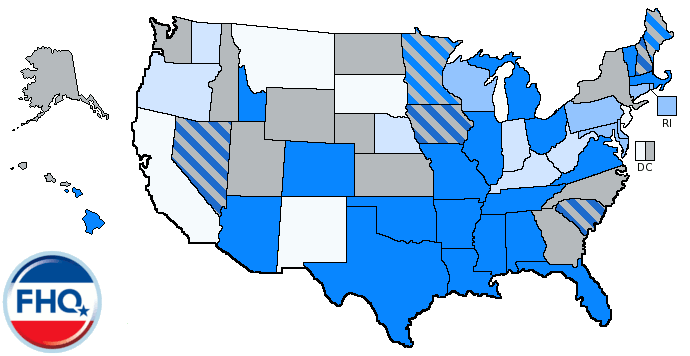 For example, Georgia has 42 district delegates (because of 14 CDs), and 30 at large / bonus delegates. They hold their primary in February, so now that's down to 21 district delegates and 15 at large / bonus delegates. If they want to allocate their district delegates via WTA by CD as provided for in this rule, how are they going to do it, seeing as how 21 divided into 14 gives 1.5 delegates per CD? How do you win a fractional delegate? It's an open question. 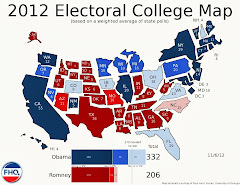 After the RNC ruled in November 2007 that they would, in fact, be sanctioning all the pre-February 5 states (except Iowa and Nevada), the sanctioned states made up new rules on the fly. Florida had a districted allocation with a statewide component, but decided to allocate all 57 delegates they ended up with to the statewide winner. Michigan pretended like nothing had happened and took a full delegation to the convention, but only had 30 votes and not 60. It is unclear how South Carolina dealt with the allocation in their congressional districts or if they did at all. Wyoming's delegates went to the convention uncommitted. We'll have to see if the RNC devises a formalized way of dealing with this or simply leaves it up to the state parties to decide how to allocate their sanctioned delegation. 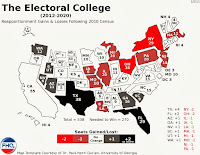 If the RNC wants to act like the DNC in 2008, they can mandate a strict proportionality requirement on the remaining delegates based on the statewide total to maximize the penalty. [No, that's not the same thing as stripping the state of all its delegates, but this is as close as the GOP will get to that.] If I had to guess now, that would be what I think will happen: they force the proportional allocation of half the delegation based on the statewide vote total. There is no doubt that states that have allocated delegates on a winner take all basis will try to game it. For example, I notice the language says if delegates are selected on a district and statewide basis. It suggests states could put in all or most of their delegates into WTA at the congressional district and a bare minimum or none at the statewide level. I don't know that I'd classify it as "gaming it". The Republican Party has traditionally left the decisions on delegate selection up to the states and the fact that there is some leeway here (or that things are not spelled out so clearly in the rules) seems more a function of that than anything else. The number of delegates is fixed in any given area (congressional district, at-large, bonus). There cannot be any shifting from one category to another. What allowing states to allocate those congressional district delegates by winner-take-all does is give bigger states the ability to insulate themselves from the proportionality requirement to a degree the smaller states cannot. It is not like the Democrats proportionality requirement. 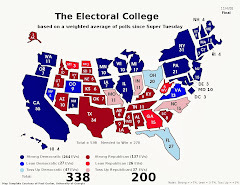 I am not clear on the proportional delegate allocation requirements, if any, on states such as Texas and New York and California that make their choices after April 1. Does anyone know? Does one have to research each post April 1 State individually?